final product from stockpiles that may have once been deemed too low grade for treatment. Blake has over 25 years experience in the mining industry holding senior positions with companies such as CSI, HWE, Barminco, Western Plant Hire and Crushing Service Solutions where he has gained considerable knowledge of mobile crushing and screening operations across many products. With this knowledge, he saw a niche for sensor sorting technology to be used in conjunction with crushing and screening to provide a service to companies across Australia with the option to provide services on a cost per tonne basis. Ore Sorting Australia was initially set up following a very large-scale test project carried out at Central Norsemen Gold Mine GNGC. This involved CSS doing a very large amount of test work with both Tomra and Steinert in relation to testing the various low-grade stockpiles on the mine and involved treating upwards of 500,000 tonnes of low-grade Ore to get significant upgrades screening out oversized Ore fractions and selective mining methods. During this time both Optical and X-ray Transmission test work was carried out with both proving very effective at upgrading these various ore bodies. 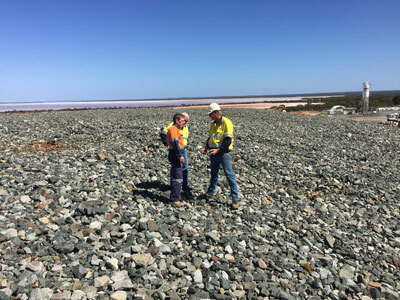 Ore Sorting Australia then commenced its first large Scale Ore Sorter project with Western Areas Ltd in December 2016 to trial Ore sorting on a low-grade stockpile of Nickel ore that was deemed uneconomic to process through their plant due to the grade and distance involved. The stockpile was crushed and screened to provide lump feed for the ore sorter. Initial trials were successful and the client elected to proceed with treatment of the whole stockpile to recover high-grade nickel. We have the experience and expertise in mining and quarrying to ensure our client’s needs are always met. We have extensive experience in sensor based ore sorting, crushing, screening and conveying contracting, mineral haulage, material processing, recycling solutions, equipment hire and sales, project management and more. In Pilbara, Bowen Basin, Surat Basin, Mt Isa, Hunter Valley and beyond, at Ore Sorting Australia we aim to meet all your specific material processing requirements – no project is too small or too big.